Why do we need to use X-rays? 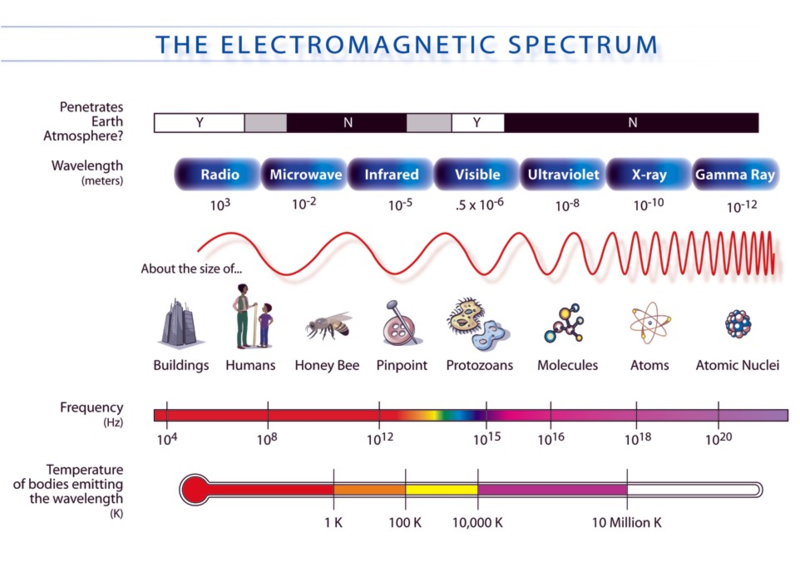 X-rays, infrared and ultraviolet light are part of the electromagnetic spectrum. Visible light (the light the human eye can detect) is one very small part of the electromagnetic spectrum. Optical microscopes can be used to study objects that are a few microns (0.001 mm) in size, useful for viewing things about the size of the cells. Molecules and atoms are too small to be seen with optical light and so we need to use light with shorter wavelengths like X-rays. We use a narrow beam of X-rays of a single wavelength, that are diffracted by the electrons in the molecules. In light microscopy, the diffracted beams are collected by lenses and then focused and magnified to produce an image. In electron microscopy magnets are used to focus the electron beams in a similar manner. Unfortunately, no such alternative exists to focus the diffracted X-rays, and instead the image has to be calculated in a computer from the diffraction data collected on the detector. This isn’t a straight-forward process as the diffraction experiment actually loses a vital component of the data, we will come back to that later! Why do we need to use crystals? Diffraction from a single molecule is far too weak to be measurable. Thankfully, crystals can provide us with ordered three-dimensional arrays of molecules, with each scattering to produce an amplification of the signal such that we can obtain reliable measurements of the diffraction pattern. The diffraction pattern is produced by constructive and destructive interference, giving rise to the spots (or reflections) observed on the detector. Each and every measured reflection carries information about all the atoms within the molecule being studied. How do we obtain crystals? To crystallise protein, first you need protein! For crystallisation, samples should be as stable and as pure as possible. Recombinant protein expression, predominately using Escherichia coli, can yield the few milligrams of protein required for structural studies. Before setting up crystallisation experiments, the protein sample should be thoroughly characterized to ensure it is suitable for structural studies. A battery of biophysical techniques may be used to check factors such as purity (mass spectrometry and SDS-PAGE), correct folding (circular dichroism), enzymatic activity (activity assays) and monodispersity (dynamic light scattering). Optimal buffers for crystallisation, i.e. those with most stabilising effect on the protein sample, can be identified using a technique like Differential Scanning Fluorimetry (DSF). All of these techniques will help the investigator increase their chances of success in the growth of high quality crystals, but even a high-purity, stable sample cannot guarantee success. Crystallisation itself is largely a process of trial and error, with some educated input! Numerous techniques have been developed to perform crystallization, but by far the most popular is vapour diffusion. Briefly, a concentrated solution of protein is mixed with a test solution containing precipitant at a concentration below that at which precipitation of the protein will occur. The trick is to find the particular cocktail for the protein of interest. Initial screening is usually performed using one of many commercially available screens, which include commonly used crystallisation precipitants like high molecular weight polymers such as PEG, or salts such as ammonium sulfate. The protein and test solution droplet is dispensed, for example onto a thin glass slide, that is then sealed over a reservoir of the same precipitant but at higher concentration. Over time the system will equilibrate through vapour diffusion as water will be drawn from the protein drop to the more concentrated precipitant solution. As the water is lost from the protein droplet, the hope is that the saturation level of the protein will increase to the point where it will come out of solution as a nicely formed crystal. However, more often than not, it will simply precipitate as a crystal will only be formed if the conditions are close to perfect! In an X-ray diffraction experiment, a crystal is mounted on a goniometer and gradually rotated while being bombarded with X-rays, producing a diffraction pattern of regularly spaced spots known as reflections. A typical dataset would contain tens of thousands of these reflections. The position and intensity of the reflections contains some of the information necessary to determine the structure of the protein; various experimental and mathematical protocols are required to solve X-ray structures as a crucial part of the required information is unavoidably lost in a diffraction experiment (see below). Figure 2: The crystal is positioned on the diffractometer and rotated while being exposed to X-rays. The resulting diffraction image is collected on the detector. The data are processed and transformed into an electron density map for interpretation by the researcher. A map of the electron density is produced, into which we fit the known amino acid sequence to produce a skeleton-like representation that shows the protein structure in a more user-friendly form. This is amazingly good fun, but becomes increasingly difficult the poorer the quality of diffraction observed. Figure 3: A well diffracting crystal will give high resolution maps (left), where individual atoms can be distinguished and it is easy to build in the correct model (centre). Poor diffraction gives only a vague outline of electron density, making it difficult to correctly position atoms (right). Our in-house X-ray diffractometer is equipped with a robotic sample changer allowing us to screen large numbers of crystals in a completely automated manner. Crystals, typically no larger than 0.1mm, are harvested in loops and stored in liquid nitrogen (-196 °C). They are screened for their ability to diffract X-rays and the best used to collect a complete data set. Using this instrument, a full dataset can be collected in a few hours and over 100 crystals can be tested in one day. The collection of data on a 2D detector is incomplete because a light wave has not only an amplitude (related to the intensity), but also a phase, which is systematically lost in a measurement. In diffraction experiments, the phase part of the wave contains valuable information about the crystal. If there is a pre-existing structure that is similar enough to our target (typically >30% sequence identity) then we can use that to recover the phase information. However, where no such model exists, there are several routes available to recover this information with the most common route being via an anomalous dispersion experiment. These experiments can take advantage of naturally present anomalous absorbers within the crystal. These can be elements such as sulfur in cysteine residues, or iodine atoms soaked in as part of the crystallisation protocol, both of which may be detected with in-house (λ=1.54 Å) radiation. Alternatively, we can produce protein in which the sulfur in methionine has been replaced with selenium, or soak in one of any number of compounds containing atoms that will produce an anomalous signal. Single wavelength Anomalous Dispersion (SAD) or Multiwavelength Anomalous Dispersion (MAD) measurements are then performed, in which the wavelength of the X-rays is tuned to be near or at the natural absorption wavelength of the selected element in the macromolecule. One limitation of in-house systems is that the X-ray wavelength is fixed (again, in our case λ=1.54 Å). Therefore, the wavelength required may be beyond the capability of the in-house system, so instead we take our samples to facilities called synchrotrons which can produce X-rays across a wide range of wavelengths. Synchrotrons also have the advantage in allowing data to be collected from smaller, poorly diffracting crystals and generally data collection is extremely rapid. Figure 4: A. Our in-house diffractometer, CCD detector and ACTOR sample changer; B. Schematic representation of a synchrotron; C. The Diamond synchrotron radiation source (Rutherford Appleton Laboratories, Didcot, UK).